SPC Brynn Naylor died December 13, 2007 when he was struck by small-arms fire during routine guard duty in Baghdad, Iraq. Brynn had served 15 months in Iraq on security patrol when he was killed three days before he was scheduled to return home. To his Army family, Brynn was a constant source of encouragement and strength. Even in hard times, he would challenge them to “do what we came here to do.” SPC Naylor had a strong sense of his faith, and wanted to make the transition from ‘green-to-gold’, often telling those that asked why he was never scared “I’m not afraid to do this because if something happens to me, I know where I’m going.” He never shied from sharing his faith, and on the night before he died, he re-enlisted to begin the process of becoming an Army Chaplain. 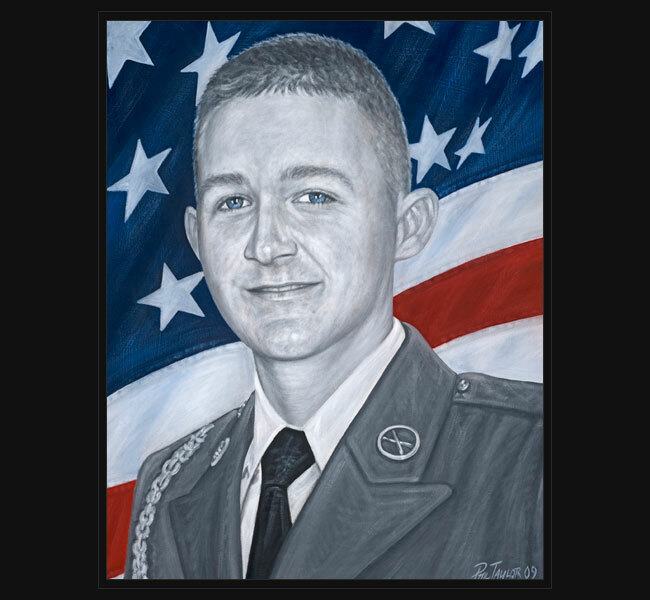 Original portrait was presented May 15, 2009 to Brynn’s mother and immediate family during a special event honoring Gold Star families in Amarillo, Texas.